So I am sitting here in our home office on our computer, at a large desk that will soon have to be sold to the highest bidder or otherwise relinquished, and I can’t believe that this will at some point become a nursery. As if we can get this done! My past week since boards, outside of work, has been consumed by the sniffles, coughing, and reading extensively for baby prep. Sunday was cloth diaper education day. Monday was clean the office for the millionth time day. Today is – post-fitness-training (I did a lamer version of the work out because I’m not feeling well) plan the household day. A few years ago we had our closets “done” with practical shelving and racks and stuff for a pretty reasonable price, so I contacted our closet maker to do some new additions. Unfortunately, the closet manipulations look mondo expensive – 80 bucks a drawer??!!! And I’m not sure that with our custom sizing I would be able to find something over the counter. I do plan a trip to Lowe’s to check it out. But for now, I’m scouring the ‘Net for alternatives. I may have to purchase some shelving from our closet manufacturer, for fear of losing my sanity in trying to make those from scratch. But instead of expensive drawers I’m thinking that fabric drawers may be just what this girl needs. I used to DIY all the time when I was younger but growing and credit cards have led me to buy when needed. 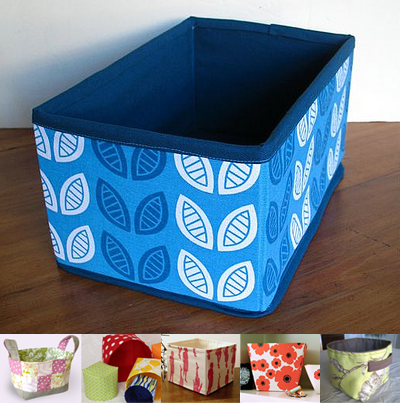 But I found this great website showing various designs for home-made fabric drawers, and this may be just what I need! Plus the designs look super-cute, yes? I think I could stop at the fabric store tomorrow and plan something for my little guy’s room! Another great tutorial for storage baskets is here!